City shaper, urban thinker and cycling advocate Sara Stace joins the dots between two tonne metal boxes and a national obesity explosion. Autonomous vehicles (AV) are the new buzzword for engineers, tech nerds and journalists alike, as the National Transport Commission forecasts their impact to be similar to the shift from horses to motor cars. Yet while significant research and scenario planning reveals diverse potential outcomes, urbanists are strangely absent from the discussion. Much of this research is being conducted by local, national and international bodies, including City of Melbourne, Transport for NSW, the New Zealand Government and the OECD. Given the historic polarities between private car ownership and public transport, everyone wants to know just what the revolution in car technology will mean for transport. In forecasting the impact of AV, we will likely end up somewhere on a spectrum between two extreme possibilities. At one end of the spectrum there’s the ‘auto apocalypse’ scenario. Here most households continue to own cars but now they’re driverless. You can call your car to pick you up from work or drop the children at school. A trip to a restaurant is no longer limited by car parking: the car will park itself or head home. In this scenario, cars essentially double their time spent on the road, with half of car journeys being not only driverless, but without a passenger. As with today cars will continue to require large upfront costs at the point of purchase, but thereafter tiny costs for each trip. This model, not surprisingly, incentivises car owners to use their cars more. Incremental exercise, such as walking to the local shops or bus stop, drops dramatically. Why bother, when the AV makes getting around so easy? At the other end of the spectrum there’s the ‘sharing autopia’ scenario. Here all driverless cars are jointly or publicly owned. You can still call a driverless car to pick you up or drop kids at school. But the car will then go to its next errand, and is rarely empty. To make it even cheaper, you can elect to share the ride with someone going the same direction (like an on-demand bus). We could see up to 45 percent reduction in road transport energy demand as a result. For households this means almost no upfront purchase costs, but larger incremental costs for each trip. This might nudge you to walk or cycle to the local shops instead. Currently most cars spend more than 90 percent of their time parked, but in a car-sharing scenario the number of two tonne metal boxes taking up street space would drop dramatically, as fewer cars do more work. This is where urbanists come in: how do we claim this space for smarter streetscapes? For bicycle paths, wider footpaths, vegetation, and outdoor seating? 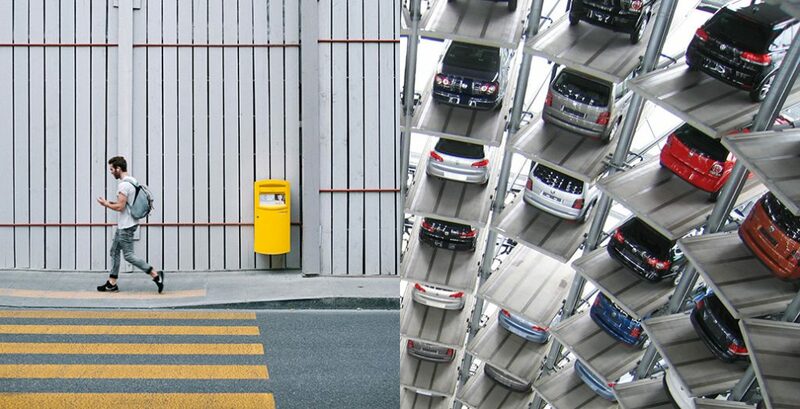 How do we convert car parking garages for other uses? Beyond urban design implications, when considering 20 to 30 year horizons we also need to look at other factors on our lives, such as public health, climate change and equality. The first of these other factors is of particular interest, considering that Australia is in the grip of an obesity epidemic. In 2011, 63 percent of adults and 25 percent of children were overweight or obese. Within a decade this is set to increase to 72 percent of adults and 33 percent of children. The additional direct costs of obesity will be $88 billion over the next decade. If you extend these projections to include broader costs, including disability, loss of well-being and premature death, that tally rises to a staggering $130 billion a year. One of the most effective means to reduce obesity is to build incidental exercise into our daily lives, through walking and cycling to work, school and to the bus or train stop. Making our streets attractive and adopting shared vehicle ownership will certainly help. However, in order to reach the ‘sharing autopia’ end of the spectrum it is essential that governments, industry, urbanists and communities play it right. We need to regulate enough to ensure that an equitable and aspirational future is enabled, but step back to allow innovation and market mechanisms to play out. That will be the smartest (and perhaps toughest) street move of all. Sara Stace will be talking at Streets 2.0: Reimagining the Streets of the Future.